If you do not require powered options, and you have a straight staircase, the Simplicity offers you a safe and cost effective way to overcome the challenge of climbing your stairs. For those requiring powered options, the Simplicity Plus is a stylish solution to overcome the challenges of climbing straight stairs. The Simplicity Plus combines the continuous track of the Simplicity with the seat of the Sterling 1000. The upholstery is available in a selection of six colors. 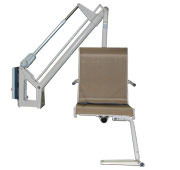 The Simplicity Plus offers the choice of manual or powered folding footplate and swivel options. 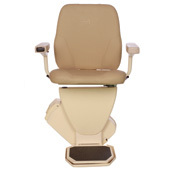 The Sterling 1000 straight stairlift is equipped with the Smart Seat which provides comfort and support and gives the option of upgrading with powered features. In addition to this the anodised aluminum rail offers a stylish solution with a hidden gear rack. The Freelift Van Gogh consists of a single tubular track, which is less than 8cm in diameter, and provides a safe, smooth and comfortable ride up even the most complicated of staircases. The track is available in three standard colors and optional in any RAL color for an additional charge. It runs almost silently and the compact design allows plenty of space for other stair users. 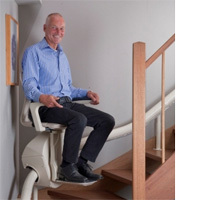 The Rembrandt stairlift has the same luxurious and low noise qualities as the Van Gogh but is specially designed for the inside bend of the stairs. The track runs above the narrow side of the stairs, the broad section of the stairs remains completely free for other stair users. The track comes in three standard color choices, cream, grey and brown, but can be supplied in any RAL color as a 'special' order. It isn't only stairs inside the home that cause problems for some people. Steps up to a porch or front door can be equally difficult to climb. 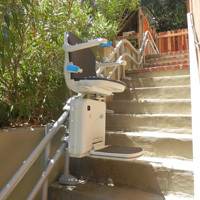 The Sterling 1000 Outdoor stairlift is fully waterproofed and designed to overcome the problems caused by external straight runs of stairs. Like the Sterling 1000 Outdoor the Sterling 2000 Outdoor is fully waterproofed however, contrary to the 1000 Outdoor the 2000 has been designed for curved stairs. Like all Sterling stairlifts the outdoor models have a key switch to prevent unauthorized use of the lift, which means it can be isolated when not in use. Supplied with UV protected Slate Grey upholstery the Sterling Outdoor stairlifts also come with a waterproof cover to keep it protected from the weather so it is always ready for use. 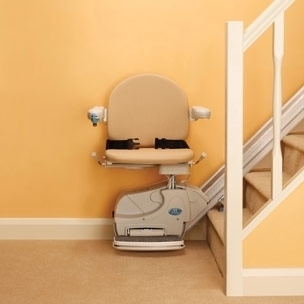 The decision to install a stairlift is sometimes a difficult one to take but when compared with the alternative of moving house, or living on one level of their home, many people have it to be the preferred option. 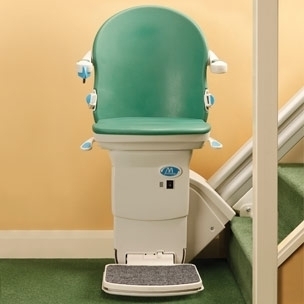 Sterling Stairlifts offer straight and curved stairlifts. 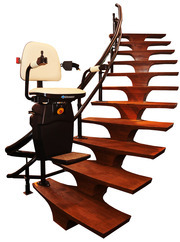 Straight stairlifts are suitable for use where a stairlift only needs to travel in one straight line. Sterling offers a range of straight stairlifts to suit your needs. Curved stairlifts have tracks that are specifically designed to suit staircases that turn corners or are spiral. All tracks are made to order following a survey of each individual staircase. 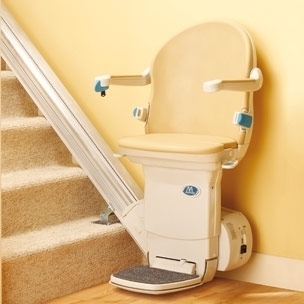 All Sterling Stairlifts have safety sensors on the power pack and footplate that are designed to stop the lift if it meets any obstruction. They also have a diagnostic display so you can monitor the status of our stairlift. 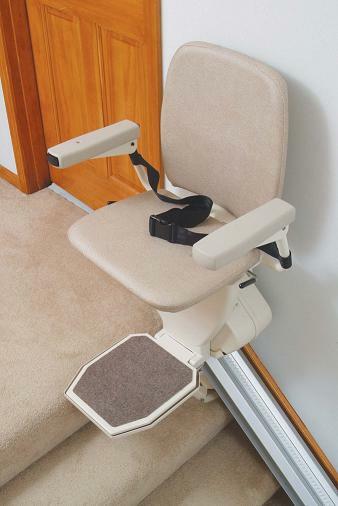 All stairlifts come with a seat belt as a standard, giving you additional peace of mind. 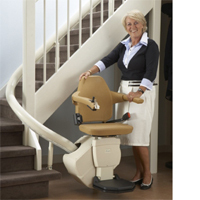 The ease of using the stairlifts by pressing or holding the large, robust toggle switch is just another added feature. The toggle switch is located at the end of the seat arm and can be operated by hand or arm. Sterling Stairlifts from Handicare are supplied with a 2 year warranty on all parts plus a LIFETIME warranty on the motor gearbox. Come see and try our model on display!!!!! 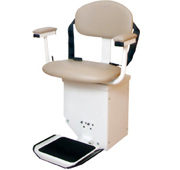 Harmar manufactures safe, reliable and easy to use stairlifts. Harmar stairlifts use DC electric power, which means no messy trailing cable, and because the unit is battery powered it will work even if the electricity goes out. The Pinnacle is the true essence of an affordable and necessary luxury. 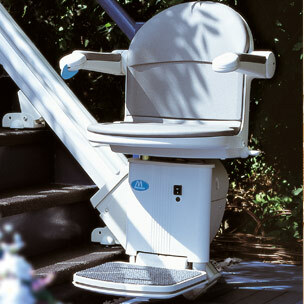 The slimmest and most light-weight stair lift on the market, it folds to take just 11” of staircase width. Pinnacle's patented helical worm gear drive system requires less energy to operate and can make up to 40 trips should the power go out. The unique drive system does not require any messy greases or lubricants! Harmar delivers an industry-leading 600-pound capacity with the all-new Pinnacle™ SL600HD stairway lift. Extending the many benefits of the Pinnacle’s patented Worm Drive, the SL600HD features a premium ride, little to no maintenance, comfortable seating, and ease of access with a 90° swivel -- now with extraordinary lifting capacity. Harmar's innovative Helix Curved Stair Lift handles everything from spirals to sharp angles, right or left turns. Practical and beautiful, the slim profile saves space and mounts safely inside or outside the stairway to maintain pedestrian access. Choose from a wide selection of seat colors and pad coverings for a customized application, inside or outdoors. Whether synthetic, velour, or leather, all fabrics are designed to be durable, easy to clean and flame-resistant. Meets and exceeds ADA specifications. Curvilinear tube with base installs directly onto pool deck with four bolts. Durable powder-coated frames create a smooth layer of color for a long-lasting and beautiful finish that resists peeling, chipping, and fading.